Earth's increasingly deadly and destructive climate is prompting social work leaders to focus the profession's attention on one of humanity's most pressing issues: environmental change. Typhoons are hitting the South Pacific with greater severity and regularity. Hurricane Katrina prompted the largest forced migration of Americans since the Civil War. Civil conflicts and instability in the Middle East and Africa are being linked to climate change and its socioecological effects. "We see it perhaps most importantly as a social justice issue," said Lawrence Palinkas, the Albert G. and Frances Lomas Feldman Professor of Social Policy and Health at the USC Suzanne Dworak-Peck School of Social Work. "Generally the people most affected by climate change tend to be the poor, older adults, children and families, and people with a history of mental health problems—populations that are typically the focus of social work practice." This inherent link between social work and the social and economic consequences of environmental change is at the heart of a new initiative Palinkas and other social work scholars are leading as part of the Grand Challenges for Social Work. Organized by the American Academy of Social Work and Social Welfare, the national effort seeks to achieve societal progress by identifying specific challenges that social work can play a central role in overcoming—in this case, creating social responses to the changing environment. "Where we see social workers playing a role is developing an evidence-based approach to disaster preparedness and response," Palinkas said. "How do we provide services to communities that are devastated by natural disasters? How do we help populations that are being dislocated by virtue of changes in the environment?" Not addressing this issue is likely to have dire consequences. At a policy meeting in London in December, military experts warned that dramatic shifts in the natural and built environments could trigger a major global disaster in the near future. "Climate change could lead to a humanitarian crisis of epic proportions," retired Brig. Gen. Stephen Cheney, CEO of the American Security Project and a member of the U.S. Department of State's Foreign Affairs Policy Board, said in prepared remarks. "We're already seeing migration of large numbers of people around the world because of food scarcity, water insecurity and extreme weather, and this is set to become the new normal." To describe their vision for social work's role in this grand challenge, Palinkas and his partners outlined three main policy recommendations for the profession. The first recommendation centers on reducing the impact of disasters such as extreme weather events. Climate-related catastrophes affect more than 375 million people every year—an increase of 50 percent compared to the previous decade. Palinkas emphasized the need to develop and spread evidence-based interventions to combat that risk and respond in the wake of disasters, in part by ensuring that all clinicians and social work students receive training in disaster preparedness and response as a critical component of the job. "That includes things like training communities in the use of evidence-based practices to provide treatment for traumatic symptoms in the aftermath of a disaster," he said. "We also need to promote social cohesion and community resilience to mitigate the possibility of social conflict." Leaders from the USC Suzanne Dworak-Peck School of Social Work are ahead of the curve in tackling that piece of the puzzle, most notably in the Pacific Rim. In recent years, for example, a team of researchers and practitioners from the school has led humanitarian missions to the Philippines following major typhoons. Faculty members Marleen Wong and Vivien Villaverde are among those who have traveled to the South Pacific to offer training sessions on delivering psychological first aid, addressing secondary post-traumatic stress and promoting social development. 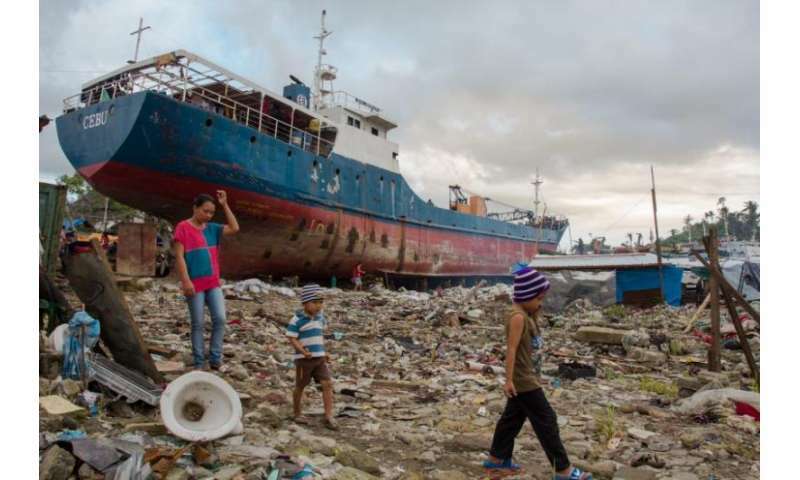 "In many parts of Asia, the infrastructure for disaster response and recovery is weak," said Villaverde, a clinical associate professor with expertise in disaster preparedness, crisis interventions and trauma-informed care. "At the same time, that's where a lot of climate-related natural disasters are occurring." Social workers can assist during recovery efforts by offering interventions and training others to use them, she said, but broader efforts to prepare for and respond to crises are needed. Although the USC team has generally focused on the intervention component, Villaverde noted an increasing emphasis on the multi-tier framework described by Palinkas and other scholars in the Grand Challenge policy brief, which calls on governments and private organizations to begin planning for climate change and related disasters at a national and community level. Wong echoed the need for countries like the Philippines to move beyond merely reacting to environmental disasters, particularly in terms of developing proactive plans that outline how various government agencies, community groups and individuals can prepare for and respond to catastrophes. "Social work has a clear role to play in building that safety net," said Wong, senior associate dean of field education and clinical professor. "We can bring our knowledge and skills and develop additional ways of supporting people, especially children and families, in the wake of these natural disasters." Many of the goals of the Grand Challenge team are broad and seemingly nebulous, so developing metrics that highlight progress could prove difficult. However, Palinkas said markers such as reducing the prevalence of environmentally induced diseases by a certain percentage might serve as signals of success. "We may not reduce the number of natural disasters, but we may reduce the number of displaced families," he said. "We may reduce the incidence of psychiatric conditions like PTSD or generalized anxiety disorder that are often associated with exposure to these kinds of events." In general, many are encouraged the Grand Challenge and the overall concept of responding to environmental change from a social perspective is gaining awareness among social workers and others in the helping professions. Palinkas, Wong and other leading scholars have been crossing the globe to highlight the Grand Challenge initiative, delivering speeches in places like South Korea, Portugal, China, Singapore, Papua New Guinea, Philippines, Taiwan and Switzerland. "I think social work is really well positioned to address this challenge," Wong said. "Social workers never work alone; they always work as a team. In these complex situations, we need to build teams to enhance the national capacity to respond." The impact of climate change has only just begun in small ways. At the moment, the impacts are small and cannot be proved to be the result of climate change. As the impact grows, the climate change cause will become obvious. In time, as the oceans rise, there will be displacement and hunger. The great food producing deltas of the Nile, Ganges, and Mekong will become saline and cease producing food long before they get submerged. Climate refugees will become a tidal wave of humanity trying to survive. India will NOT take Muslim refugees from Bangladesh. They will die by the tens of millions. The people of Egypt have nowhere to go. Muslim countries do not welcome refugees, even Muslim refugees. At the moment, the impacts are small and cannot be proved to be the result of climate change. As the impact grows, the climate change cause will become obvious. Well, that is certainly not a consistent statement with the AGW cult leaders. They say the impacts are everywhere and NOW. From the social distress in sub-saharan africa to the rise of global jihad - for any topic there is a paper that links it to AGW.